The Black color is regarded as base color for wild betta. The Iridescent Blue or Green is the most dense at the top layer while the Yellow is the least dense at the bottom layer. This Yellow color is so much less dense than all the other colors and is, by nature, a light color that it can be safely ignored in a discussion of Wild Betta color. Let's go back to the domestic (not the wild type) betta. Each of these Colour Layers has a genetic code or a series of genes that determine the colour of the Betta. The gene either increases or descreases in pigment depending on the layers. It also control where each colour is distributed. Therefore, your betta colour is determined by the colour pigments in their colour cells which are found within the layers of the skin. Traits (known as Phenotypes) are what we see. Genes that make up the traits (known as Genotypes) contain the information for the proteins that catalyse the reactions to produce the pigment we see. It can be very complicated, and when breeding fish outside of an established strain--anything can happen! This layer is also know as the Blue Layer and controls the amount of blue pigments in your betta. i) b1b1 - This will produce Steel Blue iridescents, giving a Steel Blue betta. 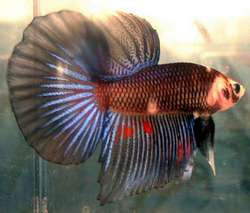 ii) B1b1 - This will produce Royal Blue iridescents, giving a Royal Blue betta. iii) B1B1 - This will produce Green iridescents, giving a Green betta. So when you breed a pair of Steel Blues (b1b1 x b1b1), you will get 100% Steel Blue. Same goes to breeding a pair of Green (B1B1 x B1B1), you will get 100% Green. But when you breed a pair of Royal Blue (B1b1 x B1b1), you will get 50% Royal Blue, 25% Steel Blue and 25% Green. It should also be noted that if a lot of black pigment is under the iridescent layer, the colors will appear much darker and richer and if no Black is present a more pastel appearence is created. Spread Iridocytes : This gene gives a betta it's metallic reflection, producing colours such as turquoise. Iridocytes is the name given to the crystals that create the iridescence that give the blue to green colouring. Spread Irodocytes refers to the genetic SiSi which increases the amount of iridescence seen in the betta. It is not a completely understood gene at this time but it is known that the combination sisi creates greatly reduced iridescence. With the wide range in amounts of iridescence that are seen in various specimen, it is possible that Sisi could create an intermediate level of iridescence or that there may be more than one gene pair involved. Non-Blue gene is what you have when you get a betta that consists of no Blue Layer. There has not been a gene identified that creates a complete elimination of the blue layer. However several breeders have breed bettas that do not show any signs of blue. It is therefore argumentative. However in the case of a blbl combined with sisi, the blue layer could be very limited and create only a small silver glow to the point where it may not be recognized as an actual blue. When you add to this the Cambodian, and Bright/Blond trait in yellows and whites, you may actually have the compounding effect limiting the blue layer. However, there may still be an unrecognized gene to create this No-Blue which has not been identified yet. Cambodian - Besides the traditional Cambodian style betta, which consists of a flesh colored body and red fins, nowadays you can find a wide variety of betta that are termed 'Cambodian'. - The Cambodian gene is Double Recessive (Double Recessive is weak) which can be best represented by cc. When the gene is present, it eliminates all dark pigment. - Some of your newer cambodian types have blue, green, white and even purple fins. Blond/ Bright gene is also Double Recessive, represented by bb. Its effect of limiting the Black pigment is best seen in the red bettas where its presence creates a bright red fish. Where if this gene is absent, it results in a maroon colored fish creating a much darker color. It also comes into play with iridescent fish making them appear much more pastel colored. Melano gene, which is double recessive mm, increases the black pigments in a betta, thus you will end up with a black betta. Unfortunally, somewhere along the line, with the increase of this gene it causes most melano females to be infertile. Thus a breeder would have to cross their black male with a blue or, better yet, a black lace female. Black lace have almost transparent fins. The females are fertile and also a pure Black Lace pair will breed Black. The above 4 genes will determines the amount of red in a betta. Extended Red gene called R will control the distribution and intensity of red in a betta. If it's termed Extended Red, it means the red will cover the entire body and fins which is most desirable. This gene R is similar to the Si gene, as there are varying degrees in the red. If a betta has less red distribution, it is represented by rr, while one with more red is represented by RR. Reduced Red bettas will have a darker body (blue, green or black) with red fins. No gene has been identified that reduces the red. Non-Red gene is Double Recessive nrnr, and does not show any red pigment. Most believed that the non-red gene modifies the pigment from red to yellow pigment colour which is appearing slightly. Variegated Fins gene controls the red in fins and create the effect which we termed Butterfly. Dr. Gene Lucas refers this gene as Vf, which controls the variegation of red in the fins. The distribution of red in the fins can be in various patterns as well as intensity. - The absence of the Red Layer, Black Layer and the Iridescent (Blue) Layer. So far, there have been no genes identified that control the yellow layer of pigmentation. This means that a Yellow betta has Cambodian (non-black) pigments in the Black Layer, Non-Red pigments in the Red Layer, and Non-Blue pigments in the Iridescent Layer. However, some said that the yellow could be related to an Opaque gene.